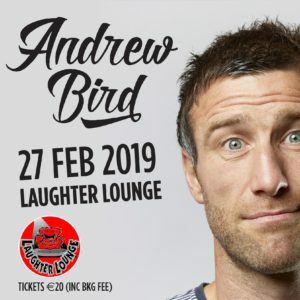 Comedian Andrew Bird is returning to Laughter Lounge for headline show in February 2019. Funny guy Andrew Bird has supported Rhod Gilbert, Rob Brydon and most recently, Michael McIntrye, on his arena tour. In addition, the Comedian has written for successful British television shows, 8 Out of 10 Cats Does Countdown and Lee Mack’s Duck Quacks Don’t Echo and is a regular guest on BBC Radio’s The Rhod Gilbert Show. Andrew grew up in a small town, moved to London where he met his wife, and moved back to a small town where they had their children. The comedian's comedy features observations and stories about marriage, parenthood as well as the petty grievances of modern life. Andrew's witty twist on the relatable topics of everyday life, makes him an effortless natural storyteller.